In Tamil nadu, people make ennai kathirikkai kuzhambu in different ways. This is my MIL's version. Basically I am a big fan of brinjal recipes.My mom usually makes brinjal gravy for idli and stuffed brinjal poriyal . After my marriage, I learnt some more varieties of brinjal recipes from my MIL.One among them is Ennai kathirikkai kulambu. I love this gravy a lot.Sendhil who hates brinjal loves this gravy a lot as it has pepper. It looks like puli kuzhambu but tastes different. I think most of you have your own version. Here comes our way of making it. Do try this. You will love it for sure ! If you are looking for Ennai kathirikkai kulambu with lots of oil in Chettinad style, do refer this POST. Wash and slit brinjal halfway into 4 pieces.Immerse in water till use to prevent color change. In a kadai,heat oil and roast pepper corns. When it starts to splutter ,add the remaining ingredients except coconut.Roast till golden brown.Lastly add grated coconut,roast for few seconds and switch off the flame.Let them cool. Grind everything into a powder. In the same kadai ,add 2 more tbsp of oil and add the slitted brinjal.Roast till it gets cooked.The skin of brinjal gets browned.It takes nearly 10 minutes. Take the tamarind extract and add the roasted brinjal to it. Allow it to boil with the required salt & water. Cover and cook brinjal. 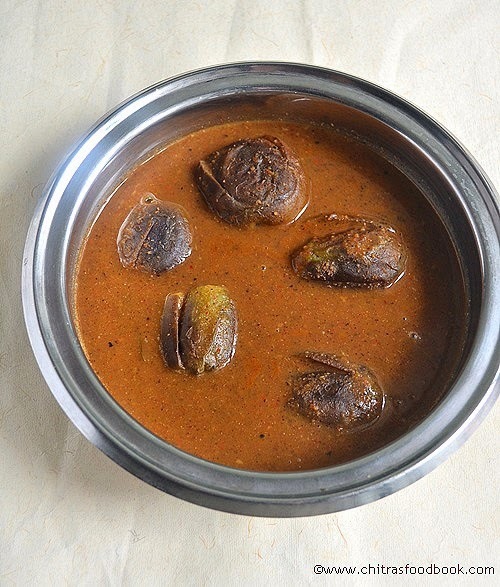 After the brinjal is completely cooked,add the roasted powder and boil for some more time.Switch off the stove and serve hot.Enjoy this gravy by mixing in hot rice topped with ghee..
Add more pepper corns and chillies based on ur spice level.The quantity I have given gives medium spicy taste. Use Tamilnadu purple or voilet brinjal for more taste and flavour. Adding ghee is a must while eating.It helps to balance the heat of brinjal and peppercorns. Serve with hot rice adding ghee ! Kinda new recipe for me and looks gud .. I do it almost the same way, but I add brinjals without roasting. Roasting them must be really enhancing the taste. I have neve rmade brinjal like this, would love to have the curry with plain rice, looks yumm. kathrikai kuzhambu looks delicious...very new to me ...brinjal is my family favorite veggie ...i will try this ..thanks for sharing this...first time to ur blog ,u got a lovely collection of yummy recipes ...very well explained too...happy to find u.
same here love eggplants too. this one is perfect with rice. Such a droolworthy kuzhambu, makes me hungry..
Brinjal my fav too..Loved the gravy..
All time fav one.. I love this like anything and this look soooooooo yummy!!! Nice curry.Brinjal in any form i love it. I too am a big fan of brinjal..this curry looks mouth watering! lovely pic and looks like a tempting curry. I have eaten ennai kathrikkai but never in a kuzhambu. Sahll try this out. Very new to me....... Looks delicious and tempting clicks!! Will try this sure.